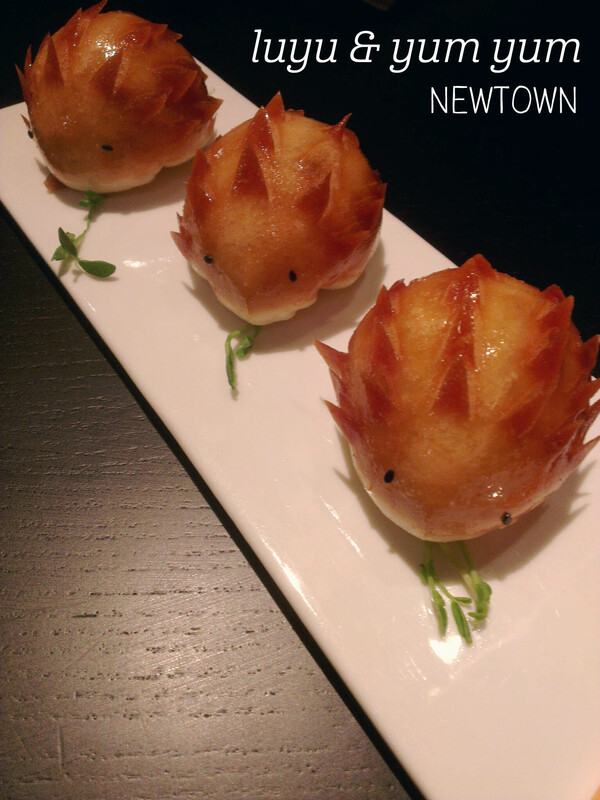 I knew I had to eat here when I saw the Instagram pictures of the hedgehog dumplings – could something so cute really be edible? Could it really be delicious? Yes, and yes. My friend and I ordered both serves of the cute dumplings – the Snow White Rabbit Dumplings ($13.80) and the Manga Dumpling (‘Hedgehog’) ($12.80), plus a serve of roast duck with plum and basil ($25.80). Firstly, this is way too much food for two people – we couldn’t finish the duck. The rabbit dumplings were packed full of prawn (yay, my favourite! ), asparagus, bamboo shoots and homemade creamy soup, with a chrysanthemum-infused dough. I found the flavour of this dumpling to be much better than the hedgehogs, although the skin was a little bit thick for my liking. The Hedgehogs had a surprisingly sweet flavour from the baked dough skin, which overpowered the subtle flavour of the various mushrooms inside. Whilst both were cute for the novelty factor, for quality they don’t have a patch on Lotus. 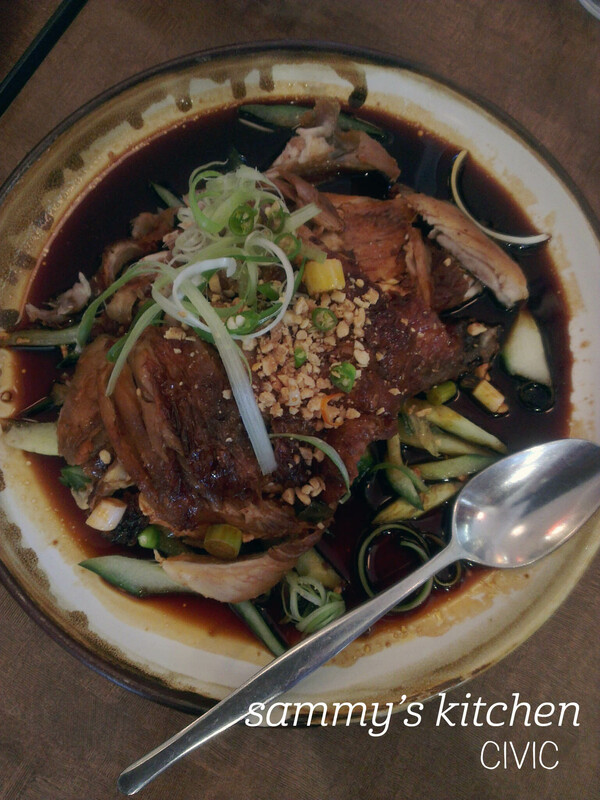 We absolutely loved the duck, though – tender, incredibly tasty and fun to eat, I would order this again for sure. Overall the food was nice, but a little overpriced for what you get. 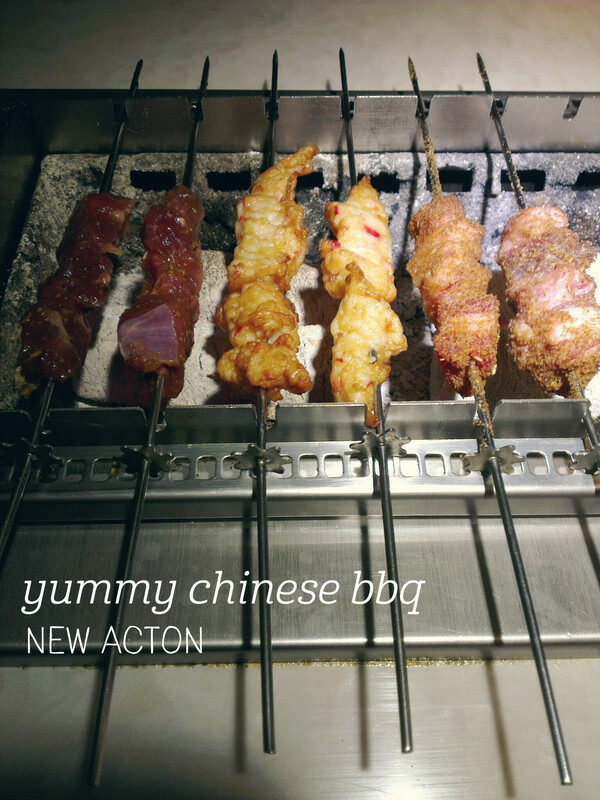 My friend and I had been meaning to go to ‘that new hot pot place in Acton’ for a while. We went on a quiet Monday night, only to discover it was actually a BBQ place. Moving right along… We were seated and told that the endless BBQ is $35 per head, so off we went (we found out later there’s an a la carte menu too). We started with a range of BBQ skewers, which each have fairly small portions of meat on them, but were delicious nonetheless. My favourite was the first I tried – the lamb, which was dusted in what might have been cumin (?). It had a fabulous flavour and I went back a couple of times for this one. The crab was battered and reasonably ok, and we both tried the chicken hearts, which were ok, but could have done with a squeeze of lemon. I was particularly taken with the sides – my favourite was simply described as “potato”, but it was more like a sliced salad, with fresh, crunchy and slightly pickled vegetables plus a hit of corriander. The handmade rice noodles with sesame sauce were fabulous too, with a great kick of heat. Overall, we decided the meal was overpriced for the quality, but it was certainly enjoyable. 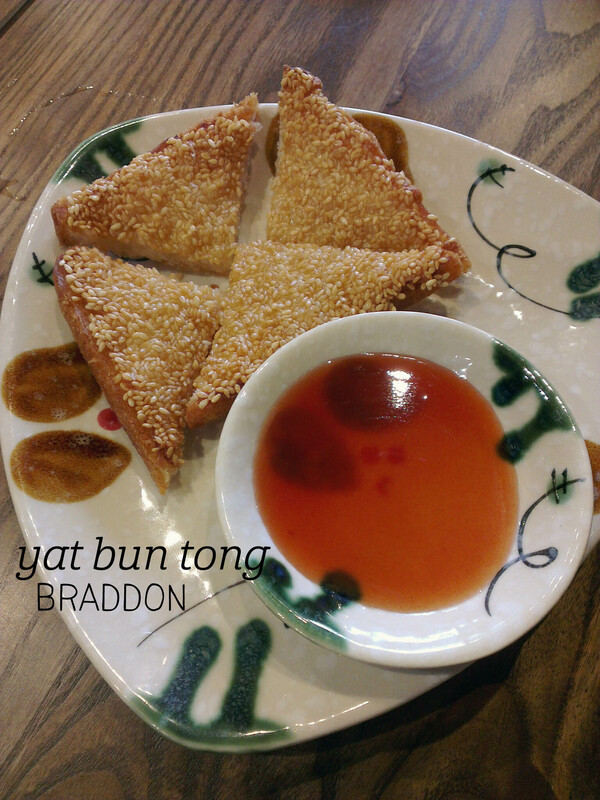 A friend and I ducked in for a quick dinner at Yat Bun Tong on a Thursday night – we were the only ones there, and ordered four fun dishes from the menu (apologies, I didn’t record the prices). I was feeling a bit under the weather, so my favourite dish was definitely the chicken and corn soup, which was HUGE and probably the most comforting thing to eat when sick – delicious. Next up was the prawn toast, which came with four triangles and a bowl of sweet plum sauce for dipping. Whilst not the absolute best prawn toast ever, it was really tasty and had plenty of sesame seeds and great crunch. Dish three was the xiao long bao (10 to a serve), which had lovely, salty soup inside. I found the skins a bit thick for my taste, and the dumpling filling was a tad small, but given the rarity of this dish in town, quite reasonable. By this point we were getting full, but the shallot pancake came out and was again more than I expected. The texture was a bit heavy on the batter side, but we devoured it – really moreish. A really enjoyable spread of consistently good dishes. Ding Hao and I go way back. This is where I used to come for yum cha as a uni student, and thankfully it hasn’t changed a bit. It’s still overcrowded, packed to the brim, and dishing up fast, fresh Chinese food. I actually went to catch up with friends from uni – the six of us got stuck right in, with no shortage of dishes coming around to enjoy. 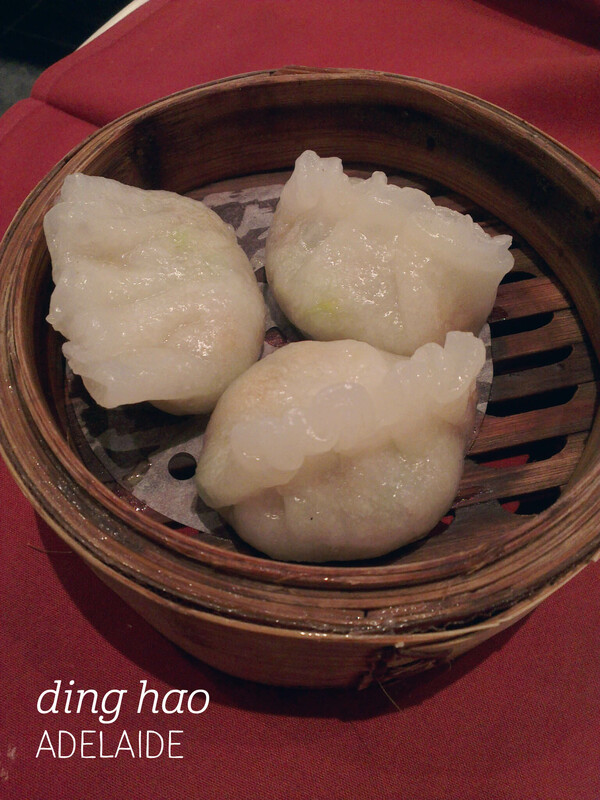 I am a sucker for prawn dumplings, and the seafood ones that Ding Hao serve are huge, tasty and definitely not full of mush. You can feel the disparate textures of the filling – so good. We indulged in a plate of salt and pepper calamari, deep-fried and full of flavour, not rubbery at all. The crispy beef was another favourite, coated in a thick sauce and with a slight chilli kick, they vanished pretty quickly. No yum cha is complete without prawn-filled long rolls (not the technical name, but hopefully you know what I mean), and I devoured my share of those before munching on some oyster sauce-drenched greens. Finally, it was time for mango pudding (more, please!) and farewells. Yum. The lovely dessert team at Lotus have created an incredible Easter dessert, which my friend and I were lucky enough to sample yesterday. 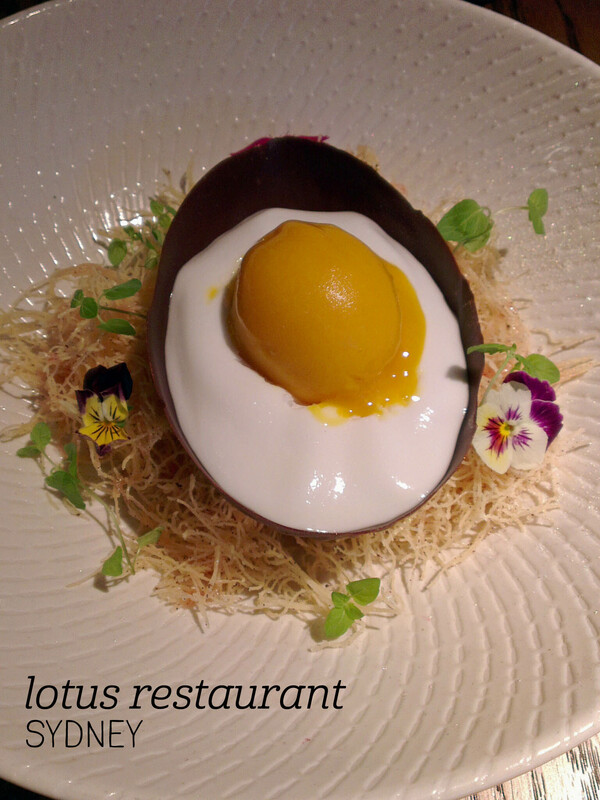 The egg is beautifully presented on a bed of fried pastry strands, with a rose glaze that reminded me strongly of musk. The strands were lovely and crispy and surprisingly sweet – I ate more than my fair share! The egg is the main game though, created out of incredibly thin Valrhona dark chocolate dusted in a brozne shimmer, filled with soft coconut meringue ‘white’ and a mango sorbet ‘yolk’. All of these flavours work well together – the chocolate is of that exceptional calibre that it just dissolves on your tongue into creamy, bitter luxury, which contrasted nicely with the sweetness of the coconut meringue. I was completely smitten with the mango sorbet; it was like eating a ripe mango, the flavour was so intense and true. The mix of textures was fabulous as well, with creamy sorbet, fluffy meringue and the crack of the tempered chocolate, not to mention the crunch of the pastry strands. Available as part of the Easter banquet or a la carte at dinner, definitely one to try before it disappears! I haven’t been to Sammy’s Kitchen in such a long time, so I was excited when we organised a work lunch there. On arrival, you notice the lovely plates with Japanese words for fruit and vegetables on them – I had persimmon on mine. We went for the $26.50 per person banquet option, starting with spring rolls and prawn toast. Guys, this is one of the biggest prawn toasts I’ve ever had, and it was amazing – entirely covered in sesame seeds and with heaps of lovely prawn meat inside, I’d come back just for this. But then we had the shantung chicken, and it got even better. Oh hello crispy skin and tender meat and unctuous sauce – get in my belly! Also a dish to come back for. Repeatedly. The beef rendang again had very tender meat and wasn’t overly spicy, and the sizzling prawns in XO sauce disappeared quickly – delicious! We were all getting very full by the time the bean curd and vegetables came out, but again this was a winner, with everyone making just that bit more stomach space to fit it in. The banquet was amazing and great value for the price. I met up with friends at Ginseng for dinner before a night at the movies, and we each picked one dish to share. We started things off with a serve of the crispy duck pancakes (normally a serve of 6, we asked for 8 to split evenly). I was impressed with the service – they were prepared freshly on the table next door for us on individual plates and the duck pieces were plump, tender and generous. The pancake wrapper was thin and there was a slice of cucumber and a small sprig of spring onion, plus the hoisin sauce. Yum. The three mains came out shortly afterwards – honey prawns, Szechuan beef and sizzling Mongolian lamb. 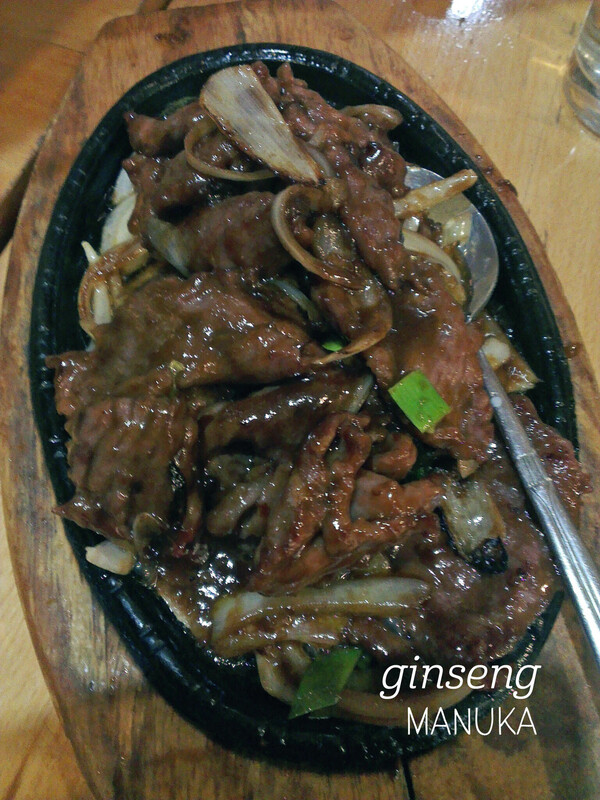 The sizzling lamb was really tender and the sauce was to die for – the right balance of sweet and salty. The beef had a great sweet and sour flavour and plenty of vegetables packed in, but I think the dish of the night was the honey prawns. Yes, I know they’re really unhealthy, but wow they tasted good! The batter was light and crisp and the prawns were so juicy, their seafood flavour enhanced by the honey. Yep, I’d definitely order like that again. Yum!